Naiad du Misselot (Davy Russell black and white checks) come with a well timed run to claim Junior (Robert Thornton blue) and Song of Songs (AP McCoy yellow and green) in the competitive Coral Cup. Naiad du Misselot came out on top in one of the most thrilling finishes seen so far this week when just holding on by a nose from the fast-finishing Kicks For Free to land the ultra-competitive Coral Cup. 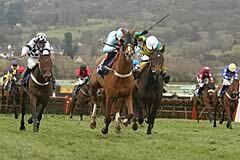 Winning trainer Ferdy Murphy said: “From where I was standing, I thought he had won. “He won on heavy ground at Haydock last time so I was happy when I saw it was raining last night. “Graham Lee has been fantastic, as he told us exactly how to ride him. He told Davy (Russell) to come down the inner and to race in mid division, towards the front. Davy did that and has given him a fantastic ride. “Graham should hopefully be back in action for Aintree. My son-in-law bought this horse and thinks he is really a chasing type. “That is what his pedigree certainly suggests and he definitely goes chasing next year. “When I was younger when you looked at a horse and people would see he’s a Cheltenham horse, or when you’re buying a horse, everyone would say it’s a Cheltenham horse. It is the big Festival and you try to give your clients a good day out . Every winner at the Cheltenham Festival is fantastic. “It’s been a good week for the north, with Howard and myself having winners and some placed horses and its nice to see the northern horses coming down and holding their own. Russell added: “Fair play to Ferdy, he was oozing confidence. Before the race he was a little worried about the ground but, having ridden in the first, I felt Ferdy was speaking about soft ground and I thought it would be soft enough for him and the horse has pulled out all the stops. Kicks For Free, partnered by Ruby Walsh, lost out by a nose in a photo for the Coral Cup to the disappointment of trainer Paul Nicholls. “It was a brilliant run but I shot myself in the foot winning at Kempton the other day because he went up 10lb for it,” said Nicholls. 1. Other than the races added to the four-day Festival in 2005, the Coral Cup is the newest contest at The Festival, having been introduced in 1993, the year after the first running of the Weatherbys Champion Bumper. 2. The first winner, Olympian, picked up an additional £50,000 bonus having won the Imperial Cup at Sandown Park the previous weekend. The bonus, increased to £75,000 in 2006, is offered again by Sunderlands, bookmaking sponsor of the Imperial Cup, to any horse that wins the Sandown race and then goes on to success in any contest at The Festival. 3. The fastest time in the 14 runnings was set in 2000 by What’s Up Boys, who scored in 4m 53.8s, beating the previous best of 4m 57.0s set by Big Strand in 1997. 4. Ireland have won the race on five occasions, most recently with Sky’s The Limit in 2006, trained by Edward O’Grady, who also sent out Time For A Run to score in 1994. 5. Martin Pipe is the leading trainer in the contest, having scored three times with Olympian (1993), Big Strand (1997) and Ilnamar (2002). Among current trainers, Edward O’Grady and Philip Hobbs (What’s Up Boys 2000 & Monkerhostin 2004) lead the way. 6. No jockey has won the Coral Cup more than once. 7. Both What’s Up Boys (2000) and Idole First (2005) scored at 33/1 and are they are the longest priced winners, while Olympian (1993) and Xenophon (2003) were successful at 4/1, the shortest priced scorers, and they are also the only two favourites to have obliged. The Coral Cup, run on Wednesday, March 12 and run over two miles and five furlongs, is always one of the most hotly-contested race of the The Festival and has received 140 entries in 2008, including 40 from Ireland. If he runs, the likely top weight will be Lough Derg, trained by David Pipe and successful in the Grade One Long Walk Hurdle at Ascot earlier this season. Pipe has a total of 10 entries in the race and could also be represented by Whispered Promises, Buena Vista, The Package, Laustra Bad, Prince de Bersy, Tino Tino, Estate, Soliya and Pablo Du Charmil. Last year Burntoakboy provided Dr Richard Newland with by far the biggest win of his career and he could attempt a repeat victory along while Hold Em has been a real star for Keith Goldsworthy this season, most recently finishing second to Aigle D’Or in the Grade Two Ballymore Properties Novices’ Hurdle at Cheltenham on Festival Trials Day, January 26. Another small trainer with a live chance is Newmarket-based Lucy Wadham who could run the smart Backbord, who won a valuable contest at Ascot last time out. The Irish-trained entries contain a number of exciting contenders including Leg Spinner from the shrewd Tony Martin yard, who won the Cesarewitch on the Flat at Newmarket in October and is a dual winner over hurdles this season on his favoured good going. Other leading Irish-trained challengers include Catch Me, Cheltenham specialist Hordago, Kasimali and Newton Bridge, a winner at The Open in November. Reigning champion trainer Paul Nicholls has entered five, including Five Dream, winner of the Brightwells Handicap Hurdle at Cheltenham on Festival Trials Day, Janaury 26 before disappointing when favourite for the totesport Trophy at Newbury. Nicholls’ other entries are Kicks For Free, Ofarel d’Airy, Sporazene and The Tother One, who is unbeaten in five starts including a Grade Three contest at Sandown on his latest appearance.